For over five decades, Formglas® has been the world's most innovative manufacturer of architectural shapes made of gypsum, composite and cement-based materials. From traditional architectural elements to modern “organic” shapes and designs, Formglas® applies its mission each day: to deliver molded architectural products and solutions that enable the design vision for interior and exterior spaces, and accelerate their construction. Formglas® products have been installed in over 30 countries across many segments of industry including: commercial, hospitality, retail, institutional, transportation, gaming, arts & culture, and marine. Call us today and get inspired for your next project. 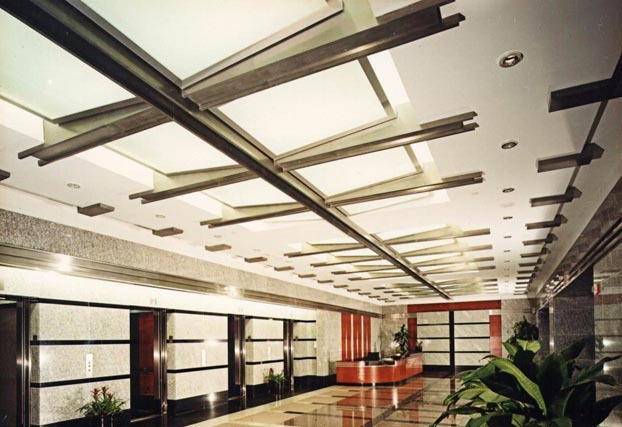 Formglas has manufacturers representatives in over 40 markets around the world, and thousands of installations globally. Visit formglas.com/reps to find one near you. 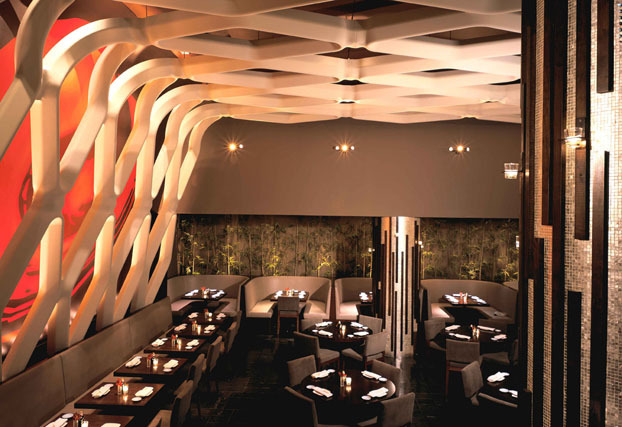 Project: Koi Restaurant, New York, NY. Design by ICrave. A wire-suspended fishnet themed Formglas® GFRG decorative ceiling. 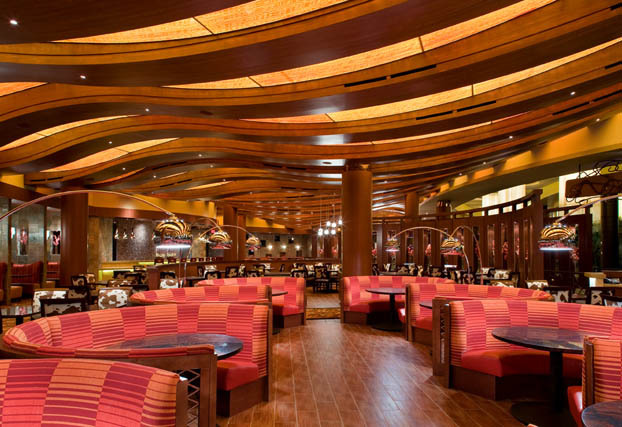 Project: Reflections Café @ Harrah's Resort, Atlantic City, NJ. Design by Westar Architectural Group. Walnut stained Formglas® Woodgrane™ curved feature ceiling components with a subtle wood grain finish. 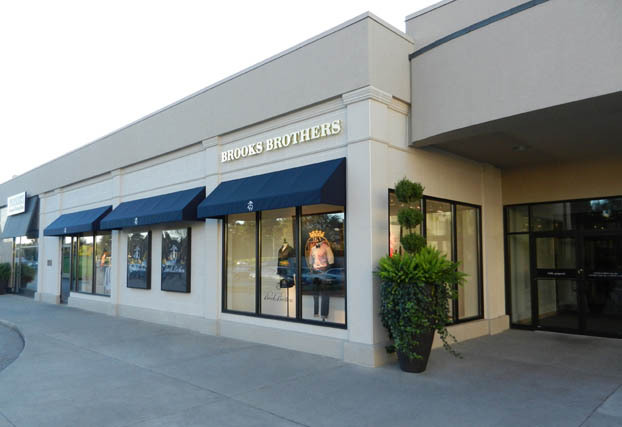 Project: Brooks Brothers Retail Store, Toronto, ON. Design by Permasteelisa North America. Formglas® GFRC-L veneer wall panels and decorative trim. 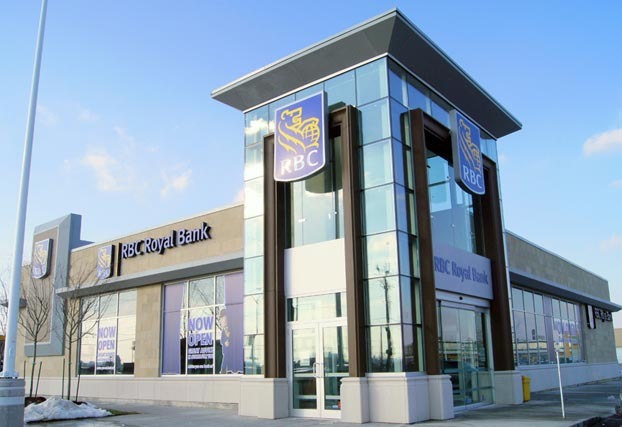 Project: Bayview Village Shopping Centre, Toronto, ON. Design by GHA Design Studios. 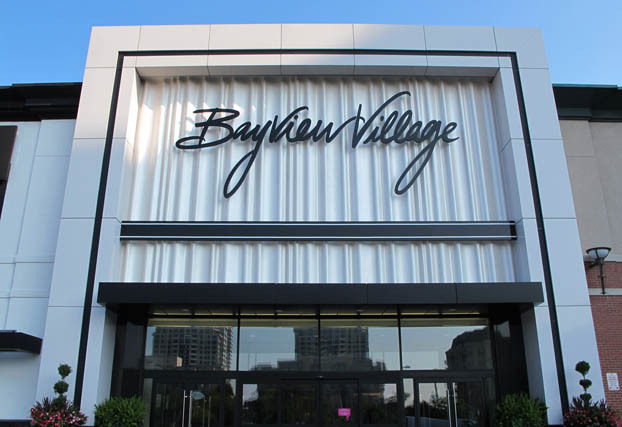 Formglas® FRP mall entry signage backer. Large corrugated panels with factory-applied pearlescent paint finish. Project: Steelcase Worklife Center, Chicago, IL. Design by Shimoda Design Group. Formglas® GFRG elliptical column covers, grille wall and double-sided grille. Shimoda Dedsign received the prestigious Good Design® award for this project. Project: Credit Suisse Corporate Office, Miami, FL. Design by RTKL. 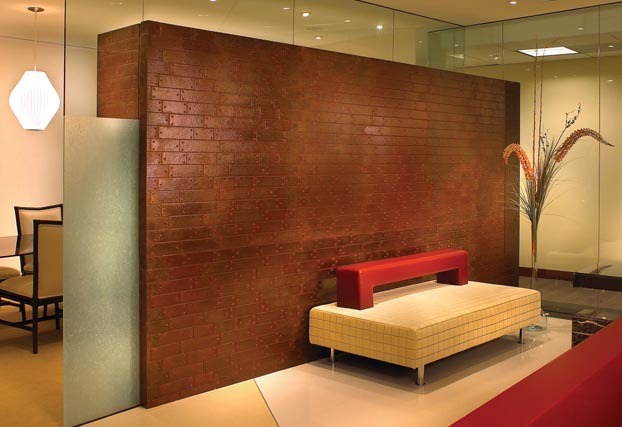 Formglas® MetalCast® copper brick-patterned veneer feature wall. 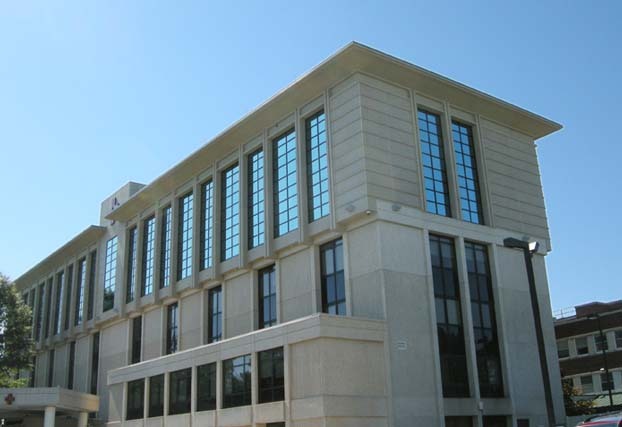 Project: St. Joseph's Regional Medical Center, Paterson, NJ. Design by Francis Cauffman. 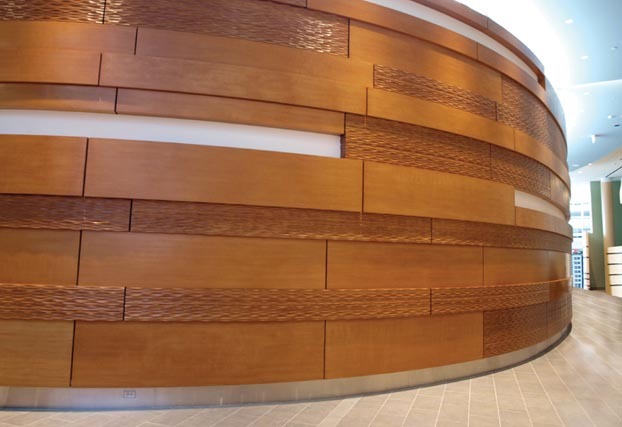 Formglas® Woodgrane™ staggered faux mahogany curved and wave panel feature wall. Project: Hamamatsu Bridal Chapel, Hamamatsu, Japan. 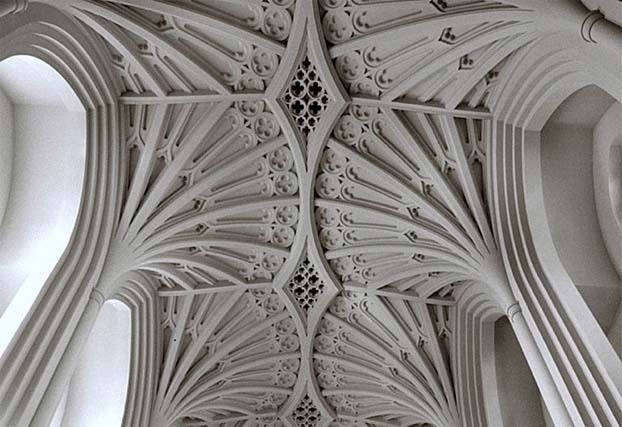 Design by Spot Ltd. Complex Formglas® GFRG classically vaulted ceiling. Project: Lancaster County Courthouse, South Boston, VA. Design by ODELL. Formglas® Cornicestone™ cladding panels, window mullion and panels located on the top two floors of this hospital tower expansion. Project: 1775 Eye Street, Washington, DC. Formglas® MetalCast® ceiling beams. 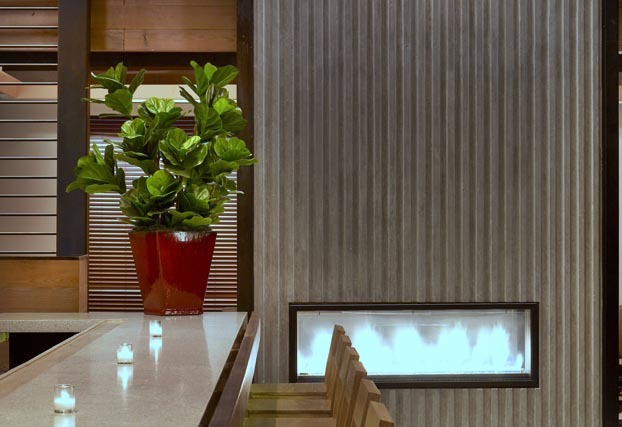 Project: Asellina Restaurante, New York, NY. Design by Icrave. Formglas® Concreet™ natural grey ribbed feature wall. Formglas® products incorporate pre- and post-consumer recycled material, and because they are molded to size, construction waste is minimized. All Formglas® materials are Class A fire and smoke rated. Interior materials are alpha-gypsum based while exterior products are cement or composite-based. All are lightweight and contribute to the reduction of substrate needed for their installation. Many factory finishes simulate conventional materials that are less "green".